“It’s not often you find a colt with a blend of athleticism and attitude that can take them to the top – I believe this is one,” - trainer Joe Pride. 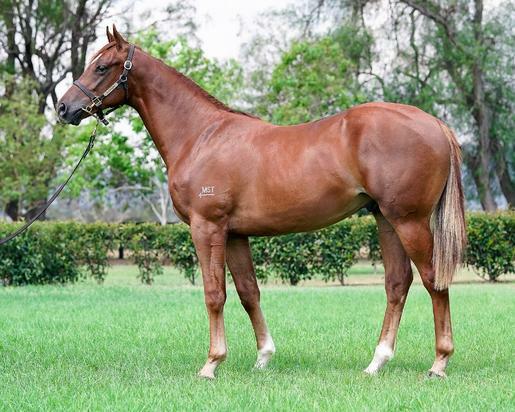 SEBRING (AUS) (Chestnut 2005-Stud 2009). 5 wins at 2, STC Golden Slipper S., Gr.1. Sire of 714 rnrs, 477 wnrs, 53 SW, inc. Criterion (Australian Derby, Gr.1), Dissident, Egg Tart, Amphitrite, Lucky Bubbles, Bring Me the Maid, Ringerdingding, Sesar, Sedanzer, Gold Standard, Seaburge, She Brings Joy, Catch a Fire, Hattori Hanzo - Let Us Win (H.K. ), Believe Yourself, Ulmann, Violate, Thurlow, Master Ash, Art Series, Broadband, Miss Admiration, etc. ARCADIA ROSE, by Kheleyf. 3 wins-1 at 2-to 1200m, A$184,250, WATC Belgravia S., L, Westspeed H., 2d WATC Westspeed H., Italo H., Westspeed H., Carlton Dry Sprint H., 3d WATC B&T Watson H., 4th WATC Burgess Queen S., L. Half-sister to ARCADIA QUEEN, ARCADIA DREAM, ARCADIA PRINCE. This is her second foal. Her first foal is a 2YO. ARCADIA QUEEN (Pierro). 5 wins from 1200m to 1800m, A$1,093,435, in 2018-19, Perth Racing Kingston Town Classic, Gr.1, Western Australian Guineas, Gr.2, WATC Champion Fillies S., Gr.3, Arlec H., Tabtouch Better Your Bet P., 3d WATC Burgess Queen S., L.
ARCADIA DREAM (Domesday). 5 wins-1 at 2-from 1200m to 2400m, A$602,750, Western Australian Derby, Gr.2, WATC Aquanita S., L, Natasha S., L, Tabtouch H., 2d WATC Champion Fillies S., Gr.3, Western Australian Oaks, Gr.3, Belgravia S., L, Ascot One Thousand Guineas, L, 3d WATC Burgess Queen S., L, 4th WATC Challenge S., L.
ARCADIA PRINCE (Pierro). 7 wins to 1400m, A$460,275, to 2018-19, Perth Racing AJ Scahill S., Gr.3, WATC Crown Sports Bar P., Peninsula Dining Room H., Tabtouch-Better Your Bet H., RTG H., Perth Racing Crown Towers H., 2d WATC Minearc Systems H., Rentokil Initial H., Awesome Rock 2YO P., 4th WATC Fairetha S., L.
ARCADIA ROSE (Kheleyf). 3 wins. See above. Sky Atlas. 3 wins from 1300m to 1600m to 2017-18, 2d WATC Devil's Lair H., Perth Racing Club Membership H.
ACTION (Pierro). 3 wins from 1300m to 2400m, A$519,200, in 2017-18, Western Australian Derby, Gr.2, WATC Tabtouch P., 2d Perth Cup, Gr.2, WATC Asian Beau S., Gr.3, Perth Racing ATA S., L, WATC Lex Piper S., L, Bunbury TC In Memory of B Ballantyn H., 3d WATC Penfolds H., Ascend Sales Trophies H.
REGAL POWER (Pierro). 3 wins from 1300m to 2200m, A$216,970, in 2018-19, Perth Racing Lex Piper S., L, Melvista S., L, WATC Furphy P., 2d Perth Racing JC Roberts S., L, Challenge S., L, 3d Perth Racing Sir Ernest Lee-Steere, L, Bunbury TC Rangeview Stud Classic, L.
ANTIQUE BELLE (Redoute's Choice). 3 wins at 1200m, 1400m, A$293,797, WATC Burgess Queen S., L, Jungle Mist Classic, L, Westspeed H., 2d WATC Challenge S., L, Starstruck Classic, L, Ascot One Thousand Guineas, L, 3d WATC Champion Fillies S., Gr.3, AJ Scahill S., Gr.3, Pinjarra Classic, L, WATC Myer Spring Fashion Trophy H., Paul Quartermaine 60th Birthday H., 4th WATC Cyril Flower S., L, Bunbury S., L.
Antique Dream (Redoute's Choice). 7 wins to 1500m, A$171,725, WATC Perth Racing Membership H., James Boag's Premium H., Kai Commercial Interiors H., Perth Cup Raceday H., Perth Racing Ascothappens H., Budget Car & Truck Rental H., 3d WATC Starstruck Classic, L, Yellowglen Perle H.
Festival Miss (Bernardini). Winner at 2 in 2017-18, WATC Tabtouch 2YO P., 2d Perth Racing Sir Ernest Lee-Steere, L, WATC Tabtouch Better Your Bet H., Murlpirrmarra Connection H., 3d Perth Racing Placid Ark S., L.